I feel like I can make a fair assessment of the movie I'm about to watch simply by the quality and inventiveness of its title card and/or opening credits. Sometimes these factors indicate nothing, but other times they can indicate something wholly crappy or what will be nothing if not an inspired trip to the cinema. There is just something about the way this opportunity can be executed that seems to somehow connect with how far the directors were willing to go to make every ounce of their film thrive. This is all to say that Good Time has a pretty fantastic one and from the moment the title card breaks up the opening sequence to the tune of Oneohtrix Point Never's (otherwise known as Daniel Lopatin) blazing score culminating in a moment of pure cacophony that continues through to a bewildered Robert Pattinson in extreme close-up's that make the tone all the more manic, we're so taken off guard that we're now seemingly prepared for anything. It should also be noted that directors the Safdie brothers (Heaven Knows What) open their film with a shot akin to that of the opening shot of The Dark Knight suggesting a scale of epic proportions even if they might not have the budget to back it up, but still-they have the ambition. Not coincidentally, the post-title card sequence shows Pattinson's Connie Nikas taking his mentally handicapped brother, Nick (Benny Safdie), and using him to help him rob a bank. The actual robbery is played not for action, but is actually rather subdued to the point it would seem Connie and Nick might actually pull their small-scale heist off, but if that were the case we'd have no movie and so when the cops finally do come to pursue the brothers and capture Nick with Connie barely evading them we are twenty-plus minutes into the flick when the credits begin appearing on the screen; Lopatin's score again throbbing like the pulse of the movie it is. Pattinson's face once again carries an expression of confusion as he makes his way through back alleys and hallways to try and evade the police for as long as necessary. This breaking up and timing of the title card and opening credits is a stylistic choice that is implemented in the fashion that it is in order to both guide the audience through and let them in on the fact that Good Time is going to be one hell of an unpredictable ride. The Safdie brothers delivering an epilogue of sorts that encapsulates everything the rest of the movie will attempt to demonstrate through its actions. In essence, the Safdie's set the stage in such a manner that while it seems the narrative is largely improvised from moment to moment that in reality, Good Time knows exactly what it wants to be and succeeds at being just that. Connie Nikas (Robert Pattinson) and his brother Nick (Benny Safdie) are on the run from the law after robbing a bank. If you look at any synopsis for Good Time it will only tell you that a bank robber finds himself unable to evade his pursuers which isn't not true, but it's also not entirely accurate of the films objective either. This is the funny thing about Good Time in that it seemingly has no plot and only a loosely connected series of events that assemble into what could be called the film's story, but rather Good Time is a movie about a man, about circumstance, about a lack of perspective, and a million other things that build what is essentially a character study of a, "winner who never wins," as writer/director Josh Safdie has put it. That winner who never gets the title is of course Pattinson's hopelessly resilient Connie who, as mentioned before, we meet as he pulls his handicapped brother away from those trying to help him as if to deny that there is anything wrong with Nick in order for him to help him successfully rob a bank of $65,000. The film gives no immediate indication of how or why Connie has come to be at this point in his life and, come to think of it, never does. 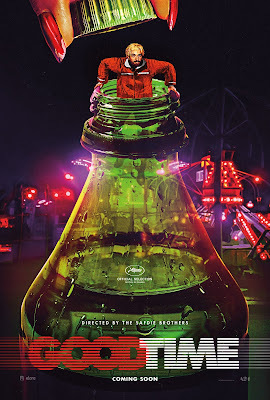 More, Good Time's script that comes from Josh Safdie and his longtime collaborator, Ronald Bronstein, allows for the viewer to piece together the past lives of each of the characters we see on screen inherently leading us to become more invested and more sympathetic for the plights they, but specifically Connie, continue to face. While it first appears that Connie and Nick get away with the amount of money it seems Connie thought would be enough to buy them a fresh start it quickly becomes apparent that not much ever goes according to plan for Connie as they discover a dye pack in the midst of the cash that goes off in their getaway car. Trying to veil the fact, but not being very successful Connie and Nick soon end up trying to outrun the cops which sees the terrified and disoriented Nick being arrested and shipped off to a Rikers island holding cell where he has no right idea how to deal with the dynamics of such a setting. Meanwhile, Connie is doing whatever he can to collect enough bail money to make sure Nick gets out of jail and back home as soon as possible-though it's not clear where that home is, what Connie plans to do moving forward, or the more relevant fact of the matter being that the stars never align for Connie; that no matter his persistence or his intelligence there is always an opposing force that seems to have the upper hand. This idea of this person who is so in and of the moment that they only contemplate that single moment of being without considering the ramifications of their actions for even twenty minutes into the future is a rather fascinating headspace to be in. Moreover, Pattinson does an exceptional job of inhabiting this kind of unhinged and crazy personality that is admirable for how effortlessly smooth he is most of the time, but also way too impulsive for his own intelligence. The most interesting thing about the character though and about what Pattinson does here is that fact of circumstance and what might have happened to this guy to bring him to this point in his life. It's such a sad fact of the matter that someone such as Connie might have excelled in a given field were they granted the circumstances of someone more privileged or even just a simple chance in opportunity, but while there are hints of what Connie has been through recently-his grandmother, who no doubt raised both him and Nick, seems to have excommunicated Connie from the family-there are only hints of what might detail a deeper family history; Nick and Connie don't seem to have an especially tight relationship, but more one where Connie has come back into the picture recently and inherently placed all of his love, his hopes, and dreams into the only family member that continues to accept him. Throughout the film, the Safdie brothers dip in and out of other hints that may or may not tell us more about the circumstances that Connie and his brother have survived and thus brought them to a place where it seemed the only option left on the table was robbing a bank for $65,000 and thinking it would be enough to give them both a fresh start, but that is where we find them and so from the outset of Good Time there is this strange sense of loss, of the fact that it didn't have to be this way, but as it is and for what the film intends to do in painting a picture of this particular type of personality it is indeed that word that stands to potentially be more of a cover-all for how I felt in response to the film more than it might come off as genuinely relaying a sense of captivation, but Good Time is, if nothing else, rather fascinating. That "winner that never wins" way of thinking bleeds into every decision that Connie makes as we watch him make what is more or less one bad decision after another, but that he clearly thinks will allow him some level of relief should just this single aspect work out. He's resourceful, but to the emptiest of ends. In his performance though, Pattinson makes ends meet by pouring every ounce of his being into this simple, but logical state of mind in which Connie operates. To say the actor disappears into the role is considered trite at this point, but he does and he carries the full weight of a film that has more thoughts than a single viewing can likely justify. Robert Pattinson plays Connie as intelligent, but impulsive and displays as much time and time again in Good Time. To the subject of substance there seems so much more to discuss and delve into with Good Time than that of Pattinson's performance, but the way in which the Twilight actor (who has long since proved he has much more to offer-see The Rover and Water for Elephants) dominates with his presence is almost as overpowering as Lopatin's score. Still, there are indeed other factors that contribute to Good Time living up to its title if not ever pushing it over the edge into greatness and transcending the boundaries of film to hit the viewer in a way in which it resonates and will stay with them for days. Rather, Good Time is a film that has visible heart poured into the craft that makes it up (see the entire introductory paragraph of this review for proof) and revels in the characterization it explores instead of the contrived plot it might have been restricted by, but while Good Time is both compelling and insanely tense in its best moments it also tends to float in and out of these moments rather fluidly with long stretches of discussion and contemplation on the part of the characters simultaneously allowing the audience what is meant to be a sense of relief from the non-stop chaos and bewilderment that Connie's improvised plans cause before erupting back into this unavoidable mayhem Connie seems destined to forever flirt with. This mishmash of stop and go never quite melds into the loose narrative the film already utilizes in the same way Lopatin's score does to the exuberantly grainy aesthetic cinematographer Sean Price Williams (Queen of Earth) employs. Despite the Safdie's never quite mastering the art of cohesion in the way their heroes like Martin Scorsese (who is clearly an influence here) do there is enough support both when considering Patton's performance as well as a few other players including Jennifer Jason Leigh in what is essentially a cameo playing Connie's immature lady friend that seems to typically have a fair amount of money at his disposal and thus the likely reason Connie tolerates her in the first place. Leigh is great in her single scene as it illustrates what the Safdie's do best in giving little to no context to the characters present situations and then allowing the audience to piece it together with the rewarding our ability to read people and figure out the type of people they have constructed for these present scenarios. That said, it is the lesser known names in the cast that truly stand to shine as both Buddy Deress, real life former convict turned actor, plays a recent parolee named Ray and Taliah Webster who plays Crystal, a 16-year-old girl who becomes entangled in Connie’s increasingly impulsive attempts to free his brother. Both actors only aid in the authenticity the Safdie's are going for by bringing down the leaps in logic the film takes and back to the raw grittiness of the means streets it takes place on.